Geek Software of the Week: Should I Remove It? This week’s Geek Software of the Week is SO completely useful, both to you and you computer clueless friends (you know that you have them!) 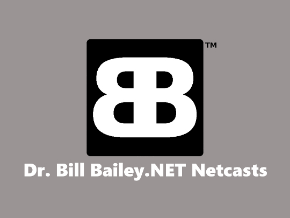 that you will wonder, “Where has this program been all my life? !” Just install it, run it, and you will know what programs people have had problems with (and therefore, should be deleted) and which ones are safe. 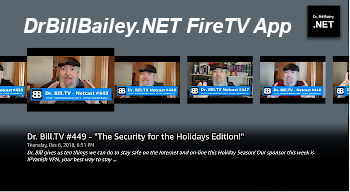 Go forth and be safe, people! “Ever wonder how to clean out your computer? Many people do, because it’s not unusual to have your PC filled with adware, toolbars and other programs you no longer need or probably never intended to install in the first place. But like most people, what programs should you remove is the tough questions. Well, we have your answer, simply download the award winning ‘Should I Remove It?’ app and wonder no more. The app is a tiny, lightweight program designed to show you what programs you have installed on your computer and quickly determine what programs you can safely remove. Bloatware and trialware refer to PC manufacturers’ habit of loading crippled versions of commercial software on a new computer in the hope that some will upgrade to paid editions. Don’t have a clue what you should remove or keep? Ever open up the Windows Add/Remove Programs app and are just utterly overwhelmed? Well, don’t worry, we are here to help! 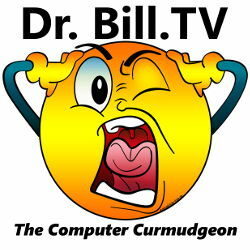 Download our completely free program and within seconds we will help you purge your PC. 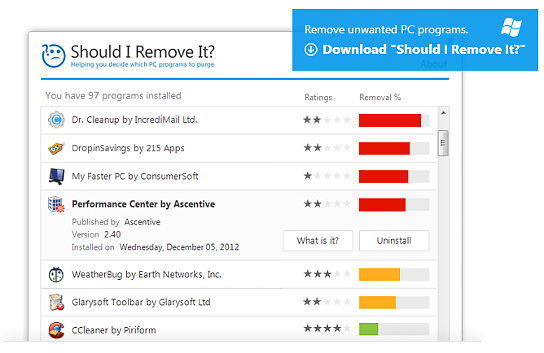 ‘Should I Remove It?’ is 100% FREE, and does not bundle any additional software, that means no adware, spyware, malware or other types of shareware or free-ware.